Going out to restaurants is one of the most popular ways that people get together. But between the wine, cocktails, bread, sides, and various food courses, dining out can easily become a production that’s uneasy for healthy eaters. Especially when “healthy” options aren’t as healthy as you might think. A lot of us are willfully ignorant about the amount of calories we actually consume when dining out. Have you ever seen the calorie counts at restaurants? And I’m not just talking about Olive Garden, Cheesecake Factory, Red Lobster, and other chain restaurants that we’ve already come to presume are a healthy eater’s nightmare. Something as innocent as an APPETIZER of steamed mussels with tomatoes, white wine, and herbs nearly hits 1,000 calories; while a lump crab tower with avocado piles up to 573 calories. Want lobster bisque? That’ll cost you 811 calories. A healthy-sounding, fish-based entree like almond crusted rainbow trout with butternut squash orzo adds up to 1,089 calories. Cashew crusted tilapia? That runs 1,318 calories. Even Chilean sea bass with shiitake mushrooms tops 500 calories. A basic vegetable side like pan roasted mushrooms can approach 600 calories. 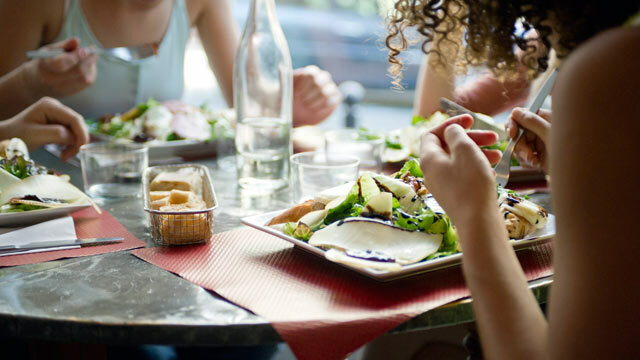 Altogether, a “healthy” appetizer, entree, one glass of wine, and a few bites of dessert can quickly add up to a meal worth 1,500 – 2,000 calories. If you’re careful, though, it’s possible to eat healthy and indulge in a nice meal by making a few easy modifications. Use these 5 tips to keep your body slim and satisfied while you’re dining out. It’s not the innocent fish or vegetables that are jacking up calorie counts. Mostly, it’s hidden ingredients like oil and butter — and add-ons, like crusts and sauces — that inevitably wreak havoc on your body, especially if you dine out often. And they’re in almost everything. If a meal seems overly tasty or greasy, with more accented flavor than what you would have expected, that’s probably because it’s not as healthy as you had hoped. Ask for sauce on the side as a dip (if necessary), as they can individually contribute a few 100 calories. Most main courses come with a starch and some vegetables — ask for the starch to be swapped out for extra vegetables or a side salad instead. Having fewer flavors on your plate challenges your taste buds. You’ll find that as you leave out added high calorie ingredients, the less you’ll need them to feel satisfied. The first thing your waiter usually asks, before you’ve even gotten a chance to browse through the menu, is if he/she can offer you a glass of wine or a cocktail. If you really like to have a drink during your meal, try to keep it to one. Keep in mind that you will be starting off 150+ calories deep. Opt for dry wines — red wines like a pinot noir have cancer-fighting benefits and are only 121 calories per glass (5 oz.) — sugarless cocktails, or a good beer. Unfortunately, there are rarely cocktails on menus that aren’t loaded with added sugar; some of which push 400-500 calories. If you’re really only able to stomach a sweeter cocktail, go for ones that are sweetened with fresh fruit, and you can always just request no added sugar. Salads are a great way to slash your appetite without consuming TOO many calories in anticipation of your main course. The fibrous vegetables help you to chew more and eat slower, which can help satisfy hunger. When ordering a salad, always ask for dressing on the side. Dressing has so much flavor, that you really only need a tiny bit to appreciate its decadence. Most dressings are composed of oil, vinegar, and herbs — and that oil can amount to about 200 calories for just two tablespoons. Creamier dressings are not any better, with mayonnaise, cheeses, and heavy sour cream to boot. Also, beware of salad ingredients. Steer clear of salads that are loaded with “crispy” anything, cheese, croutons, bacon, dried fruit, or nuts. It’s okay to have one of these higher calorie toppings on your salad, but if a salad is only your first course, you may want to save your calories for the others. Another easy trick to shrink portions and keep your meal guilt-free — without sacrificing variety or courses — is to order a meaty appetizer and side as a main course, and then get a lean salad as an appetizer. Entrees can often serve way too much meat or starch, with far too few vegetables. One example is to order an octopus appetizer (I find that octopus appetizers tend to be unexpectedly large) as a main course, and then order a house salad as an appetizer — preferably ones that have a few filling ingredients like squash, avocado, quinoa, lentils, brussels sprouts, pears, and apples. Healthier sides like sautéed spinach, kale, and broccoli are surefire ways to fill you up if the appetizer-main course doesn’t fully do the trick. A variety of foods tend to be the most satisfying. Sharing several different plates with your table is a great way to enjoy a meal without putting a noticeable dent in your calorie goal for the day. More and more restaurants are getting on board with healthier ways to make food taste delicious. Fresh black pepper, herbs, citrus/zest, good vinegars, and well-made vegetable stocks are all ways that chefs are adding flavor without the calories. Don’t be shy or embarrassed to make slight modifications when ordering. Putting aside the buttery sauce or oily vinaigrette, and substituting them for even just a slice of lemon to squeeze over your plate can really enhance your dish. You’re merely being on top of the healthy trend and most waiters will be happy to accommodate your request. Amanda Berck is a private equity assistant who doesn’t let an immobile office job get the best of her health and fitness. Formerly a top-ranked tennis player, she strives to maintain her athleticism by eating healthy and finding fun ways to exercise; whether that’s through sports or playing dance dance revolution – not kidding.